Multiplicity is the concise answer. Surrounded by the visual chaos of endlessly accessible images, it is easy to forget that before printmaking processes were developed, pictures were unique, made by hand, one image at a time. The innovation of carving an image into a block of wood, applying color, and pressing it to paper or fabric allowed for a comparatively abundant number of the same image. Despite our ability to reproduce images digitally, artists continue to embrace hands-on printing processes that allow for endless variation and creative exploration. As printmaking has developed over centuries, artists have used these processes to generate income—working as illustrators (as in the case of W.H.W. Bicknell and Claire Leighton whose work is featured in the exhibition) and by selling limited editions of prints to art collectors and tourists. 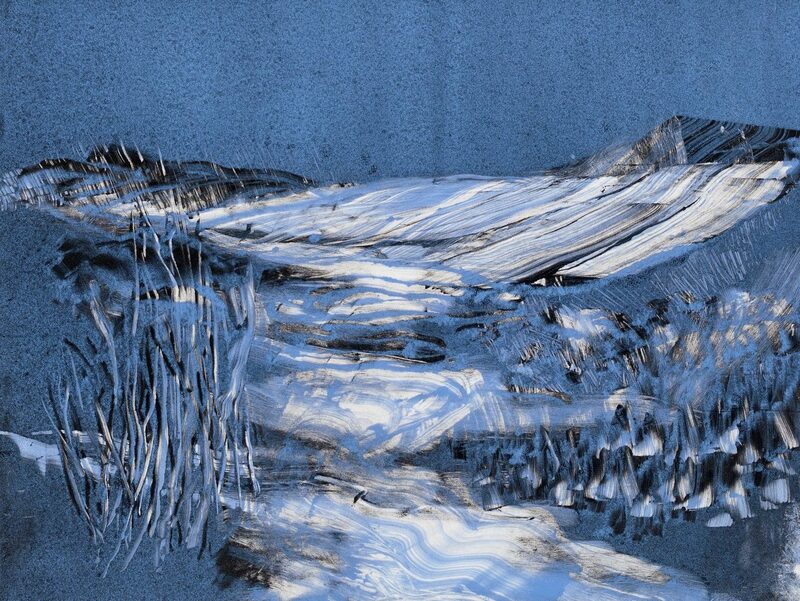 The fine art prints displayed in Multiplicity include planar, relief and intaglio processes. Dry point printmaking, a form of intaglio (Italian: to engrave or carve) is very similar to the process of drawing, in that the lines inscribed on the printing plate, or matrix, form the dark areas or lines of the final print. Linocut or “easy cut” prints are similar to woodblock prints—all are relief prints—but human-made linoleum and rubber-like composites do not present the same challenges found in a natural piece of wood, where grain, knots, and density must be taken into consideration. Monotypes, a planar printing process in which ink or paint sits on top of a smooth plate, are so named because they are unique, and can contain a range of materials, including gold leaf, scraps of paper, and found objects. As various as these techniques are, what all prints have in common is the process of transference; prints can be thought of as a happy marriage of the prepared matrix and the surface that receives the image. The Lenore Ross Student and Educator Curating Program welcomes local students, teachers, and school administrators to PAAM to engage with works of art chosen from the Museum’s permanent collection, and to create exhibitions in response to collection artwork. Since the program’s inception in 1992, PAAM has presented 100+ student and educator-curated exhibitions in the Museum’s galleries, cultural institutions, and schools. The program has been honored with the Massachusetts Gold Star Award and the Arts Foundation of Cape Cod’s Collaborative Arts Program of the Year Award. This year the program’s focus is on process first, and the works of art displayed from the PAAM collection help to illustrate the printmaking techniques explored by 14 artist educators who work in school districts along Cape Cod. These teachers came together over two weekends in June and September to work with Master Printmaker Vicky Tomayko in PAAM’s Museum School studios; limited edition books, wallpaper prints, chine collé and stenciling were also explored. Dineen D’Avena, Sandwich High School; Molly Driscoll, Eastham Elementary; Abby Fay Smith, Barnstable High; Heidi Filmer-Gallagher, Wellfleet Elementary; Michael Gillane, Provincetown Schools; Anissa Graff, East Falmouth Elementary; Deborah Greenwood, Cape Cod Lighthouse Charter School; Caitlin Greer, Orleans Elementary; Lenore Lyons & HoYin Yuen, Barnstable Intermediate; Kathleen O’Connor, Ezra H. Baker Innovation School; Kim Possee, Truro Central School; Meghan Swanson, Horace Mann Public Charter School; and Antoinette Young, Eddy and Stonybrook Elementary Schools. PAAM gratefully acknowledges the Provincetown, Truro, Nauset, Monomoy, Barnstable, Dennis-Yarmouth and Falmouth school systems for supporting innovative arts education programs on Cape Cod and the wonderful and generous artist-educators of our local schools, who enrich the lives of children and teens every day.